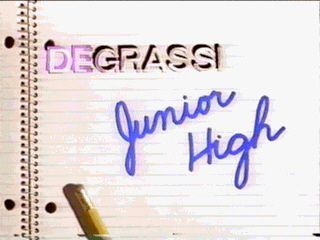 Degrassi Junior High spanned 42 episodes covering grades 7 through 9. The first season premiered January 18th, 1987 with 13 episodes. It premiered Sunday afternoons, and was brought up to prime-time in the second season. Some of the characters were in grades 7-8, The second season the characters remained in the same grades, as the 2nd season was not their next academic school , but their 2nd semester. The characters were in grades 8 and 9 in the third year. The niners stayed in junior high but were took their science classes in a high school called Borden High School. Premiered January 1987 on CBC until Spring 1989, spanning 3 seasons.